Well, in the last blog post, we started off with the python programming. This post is all about data structures, so it would be bit precise and short. In dictionary, the first one is the key to access the value associated with key. So, if we want to find a particular value associated with a key we access them directly by calling the key in the dictionary. Here, in Python, PUSH operation is performed by .append(‘argument’) method, where we can add any element at the top of the stack. 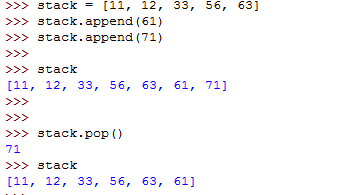 And POP operation performed by .pop() which pops the element at the top and prints the popped element. To print the values in the stack, just type the stack name and then enter, stack will be printed. 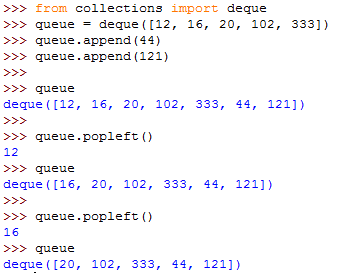 As similar to Stack, data is inserted in Queue by using .append(‘argument’) , but for popping elements, we use method: .popleft() which prints the popped element and removes it from the queue. This is all for today’s tutorial, I hopes that this tutorial will help in learning a bit of Python. Meet you with my next blog on Python.